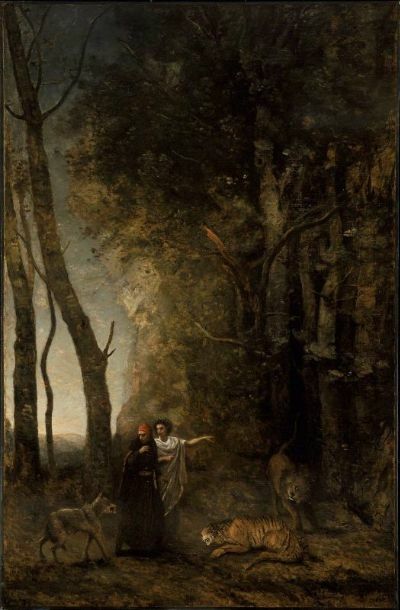 In a little-known side adventure, the Italian poet Dante encounters three savage beasts deep in a forest. Dante then meets the ancient poet Virgil, who offers to be his guide through Purgatory and Hell. The beasts then reveal themselves to be aliens from the planet Zorg, who try to talk Dante out of this whole silly journey through Hell business, inviting him instead to come back to their mothership and join in the fun of buzzing primitive planets. Not trusting the aliens, eventually the poets ditch the shapeshifters by distracting them with raw meat and continue on their way. Tagged famous paintings with SF/F titles, memes.